We can see bright colors surrounding environment because our eyes have color receptors called cone cells. A healthy and normal eyes have cones that can capture the three primary pigment colors: red pigment, green and blue. For those who suffer from color blindness, one of the cone cells in the eye is not working properly, so they are not able to distinguish colors correctly. In most cases of color blindness, damage occurs to the red or green cone cells, causing the sufferer trouble distinguishing a variety of colors. In addition, in some cases the cone cells will capture the color spectrum overlap. 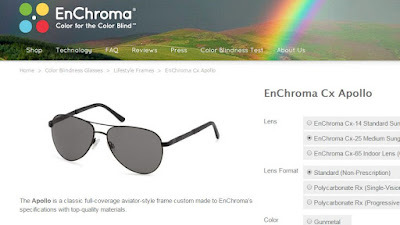 EnChroma, an eye lens company founded by an American surgeon creates glasses that are able to restore the function of the receptor cells of damaged eyes. The glasses have filters that can capture light spectrum overlap each other, pushing the "wedge" that makes the frequency of the light collide with each other. By using the glasses, those with color blindness can taste the beautiful range of colors around them through the EnChroma lens.